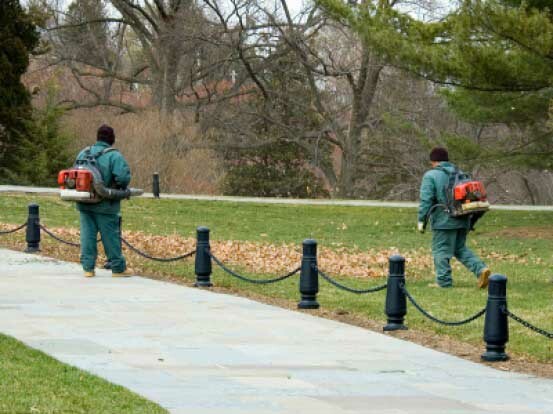 Leaf Blowers: Is the convenience worth the risk to your soil? Leaf blowers might be the easy way to clean up during routine maintenance, but they also damage soil through erosion and compaction, plus add pollutants into the air. Using an organic, Eco-friendly landscape maintenance plan involves many different elements. Focusing on the health of your soil is a big part of that. But organic maintenance isn’t just about feeding the soil and your plants, it’s also about best care practices you use to manage on your own or with a lawn care service. One part of landscape care you might not have thought much about, but has a huge impact on your soil, are leaf blowers. Admittedly, the only benefit we can see is to make easy work of cleaning up leaves, grass clippings and debris. The risks, however, are many. Leaf blowers blow away leaves and grass clippings that should remain on your lawn and mulched back into the soil, adding nutrients and improving texture. Additional clippings and leaves can be added to the compost pile. Leaf blowers will blow away freshly applied fertilizer. Over time, leaf blowers erode topsoil so the crowns of your plants are exposed and will damage the roots close beneath surface. One of the most common problems in North Texas is compaction and leaf blowers are a big culprit. Compacted soil makes it difficult for oxygen to circulate or water to permeate the surface, causing a host of problems for your lawn. Gas powered leaf blowers are damaging to the environment. They put out pollutants such as ozone, carbon monoxide, nitrogen oxides and hydrocarbons. They also disburse airborne particles that aggravate asthma and other respiratory problems. Noise pollution. Admit it, when a neighbor’s leaf blower wakes you up at 7am on a Saturday or interrupts your early Sunday coffee on the patio, you are none too happy. For: It’s convenient and fast. If you have a hardscape area covered in debris such as dirt that washed onto the pavement or leaves that dropped all over the drive, then leaf blowers come in handy. The key is using your leaf blower only on cement and other hard surfaces. Keep blower usage in planted areas to a minimum. Against: Healthy soil that is not compacted, has leaves and grass clippings mulched back into the soil or added to the compost pile, have a healthy amount of topsoil, and are fertilized throughout the year will have a positive impacts not only on your lawn, but also your entire landscape including trees, shrubs, perennials, edibles and seasonal color. Since leaf blowers cause such great harm to the soil, the trickle down effect is that your lawn and landscape plants will suffer over time. A consistent use of leaf blowers can kill off the beneficial microbes and earthworms in the soil. Healthy soil full of these living soil companions break down organic matter such as leaves, grass clippings and expired plant material so that it feeds the soil which in turn feeds your plants. We understand that while your landscape is important to you, so is the environment. If you’re concerned about soil health and soil compaction on your property, we recommend talking to your maintenance company about using other means besides leaf blowers directly on your lawn and landscape. At the very least, save it for blowing leaves off of hard surfaces such as patios and drives…but not toward your neighbor’s yard to clean up. Hand raking when necessary and adding to the compost pile is a good option. Or, spread leaves and grass clippings evenly across the lawn and mow over, then add the overflow to landscape beds. Tell us about your lawn & landscape and we’ll email a service quote to you. Spread the Green is our referral program. It's simple, and you get paid. Use our handy online payment tool to pay your service invoice.